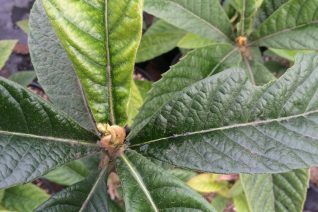 Loquat is much hardier than most people think. Enormous specimens are ancient and scattered around Portland. In my previous garden I had a huge specimen that sailed through the worst winters (below 10ºF) and epic ice and snow with NO damage. Bold, broadleaved evergreen tree. The leaves are huge and look very tropical. In winter buds clad in brown fur support many very fragrant white flowers. Loved by overwintering Anna’s Hummingbirds. If the winter fizzles out and temperature fail to drop below 20ºF you may see the small, sweet fruits ripen in summer to early autumn. Primarily it is grown for its great foliage and convenient size. To 18′ tall and 10′ wide forming a rounded crown in 10 years. Full sun and rich to average soil. Completely drought adapted but summer water will increase the growth rate. Hardy to 5ºF and does not suffer foliage damage until that point is reached. Avoid growing this tree in the windy eastern exposed suburbs of Portland. Excellent tree for a small garden. Japan.